Is there a better alternative to SemiAlt? Is SemiAlt really the best app in Contextual Menus category? Will SemiAlt work good on macOS 10.13.4? 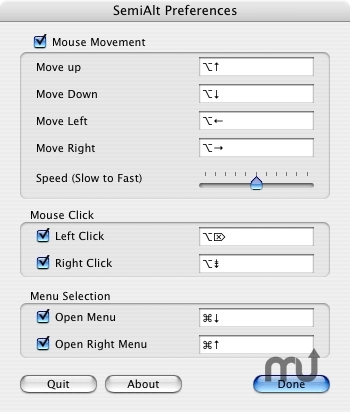 SemiAlt is a background utility that installs a number of hot keys to let you move and click the mouse, as well as open the menu bar, all from your keyboard. Some of these features are available in Mac OS X itself, but this utility offers more flexibility and works somewhat differently. SemiAlt needs a review. Be the first to review this app and get the discussion started! SemiAlt needs a rating. Be the first to rate this app and get the discussion started!